We all know that there are a lot of ways these days to make money writing online. Some are obvious, like freelance work, but others have a bit of mystery involved. Hubpages falls into this category for most people, but it’s actually one of the best places to start. It’s also a great addition to the writing-for-income portfolio for anyone that writes for a living (or is trying to!). I won’t lie, I came across Hubpages against my will. The site that I was happy writing for was sold to them and along with it, all of my content. 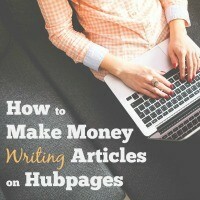 As is often the case, however, it wasn’t long before I realized the earning potential on Hubpages way more. So as you can imagine, I’m a much happier writer now. I’ve said it time and again, and I’ll say it once more – I love Zazzle. There are so many fun components about it and best of all, it pays (I’m not going to lie…that’s one of my favorite parts). 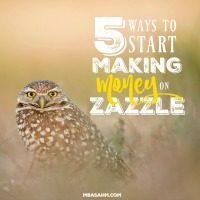 I’m a huge fan of making money from your hobbies and Zazzle is perfect for that. And honestly, once you get good at it, it can pay far more than what your accountant will consider hobby income. So how, exactly, can you do this? I am the last person in the world you would ever peg as someone that designs and sells wedding invitations, but it’s true. In fact, it’s one of my favorite hobbies. 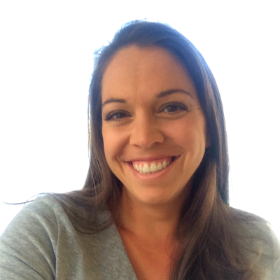 And not only does it earn me some extra money, but it is pretty easy and extremely flexible – you can work on them anytime, anywhere (which I’m always a fan of). 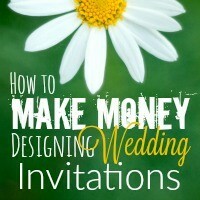 If you read my posts regularly, you already know I’m a huge fan of Zazzle and once again, that is the resource I use for creating and selling wedding collections. I love, love, love Zazzle, so I use it for all kinds of creations, but wedding collections are really popular there and for good reason. There are so many great ideas and you’re able to customize everything. I actually used Zazzle products for my own wedding. You don’t have to be Julia Child to be an impressive cook. In fact, some of the greatest recipes are also the simplest – 3 ingredient, no-bake, under $5, within 30 minutes type of meals. 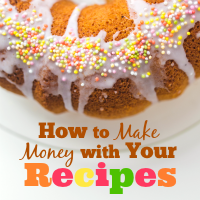 These tricks in the kitchen and family recipes are not only ways to win friends and company, they’re also a great source of extra income. And if you’re really good, you could bring in some substantial dough for your family.